How to convert and import DVD to iPod Touch 4 on Mac? If you have a lot of amazing DVD collections and want to import DVD movies into iPod Touch 4, you will need a professional DVD converting program to assist you in ripping contents from discs to iPod Touch 4 format like MP4 first. 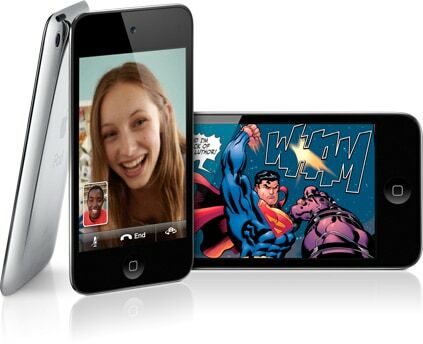 iPod touch 4 accepts MP4 video detail as follow: MPEG-4 video, up to 2.5 Mbps, 640 by 480 pixels, 30 frames per sec., Simple Profile with AAC-LC audio up to 160 Kbps, 48 kHz, stereo audio in M4V, MP4, and MOV formats. 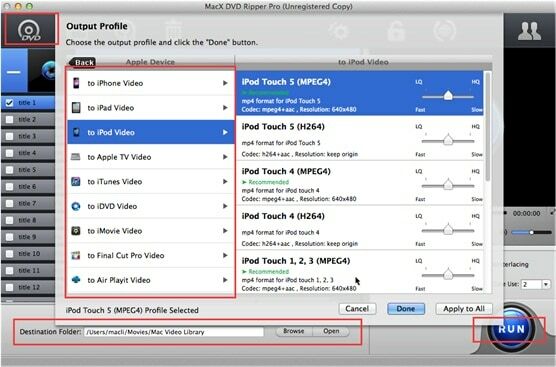 This tutorial guide will lead you how to convert and sync DVD to iPod Touch 4 on Mac OS with MacX DVD Ripper Pro, which is a powerful Mac DVD to iPod converter to rip DVDs to iPod formats on macOS as well as Windows (10) with perfect output quality. You don't need to worry about any copy protections like DVD CSS, region code, RCE, Sony ArccOS, UOPs, Disney X-project protection etc as this software will remove them all! No. 1 fast DVD video processing application to rip/convert any homemade/protected DVD movies to iPod Touch 4/5/6, iPhone iPad Android etc with fastest speed and excellent quality. 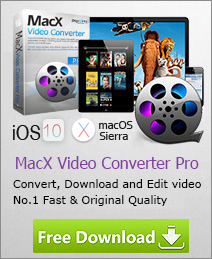 After free download and install Mac iPod DVD ripper, you can load and import source file by clicking "DVD Disc" or "DVD path". In the output format area, select the target format "to iPod". You may import DVD to iPod Touch 5/4/3/2/1, or iPhone X/8/7/Plus, iPad, Android as you neeed. Step 3. Choose Output Folder. Select where you want to store the converted video by clicking "Browse" button. Right click "RUN" to begin your DVD to iPod conversion. After the ripping process is complete, upload the converted video into your iPod Touch 4 through the sync of iTunes Library to enjoy your movie in your fashionable iPod Touch 4. Especially designed for iPod users, this iPod Touch 4 DVD ripper enables you to convert DVD to MPEG-4, H.264/MPEG-4, MOV, MP3 file, which is fully compatible with iPod nano, iPod touch 4, iPod classic with untouched quality and super high conversion speed. Download it to enjoy your favorite video on your iPod Touch 4 now!